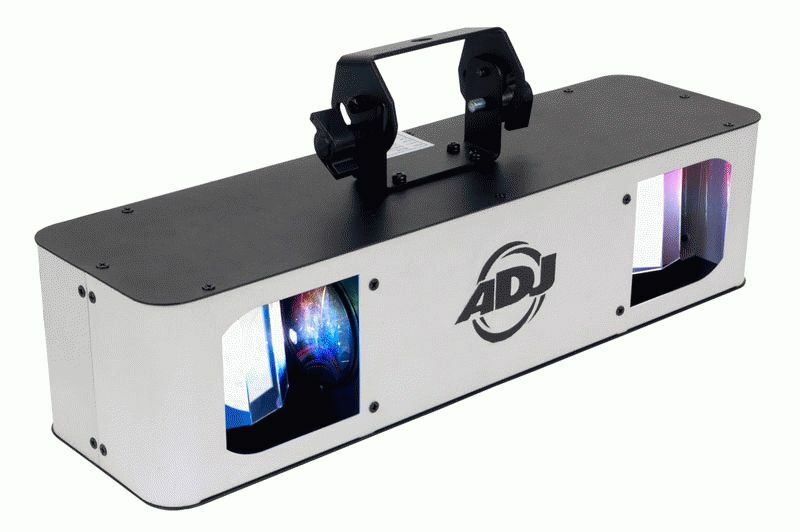 The LED revolution continues to gain steam at American DJ. The company will be introducing a variety of exciting new LED products at Winter 2012 NAMM – from all-in-one LED lighting systems, to innovative, easy-to-use effects that are great for small clubs and mobile entertainers, like the Fun Factor LED, which offers both an RGBW moonflower and an LED strobe in one compact fixture. Another must-see at NAMM is the new Jelly Par Profile Sys, a 4-unit lighting system whose low-profile par-style RGB LED fixtures combine ADJ’s exclusive sit-flat design with the company’s amazing “Jelly” translucent “color-changing” plastic casing. Also new at NAMM: some exciting LED-powered barrel mirrored effects for venues of all sizes. Fun Factor LED – This compact, affordable unit is the latest in ADJ’s lineup of products that offer end-users more for their money by combining multi effects in one fixture. 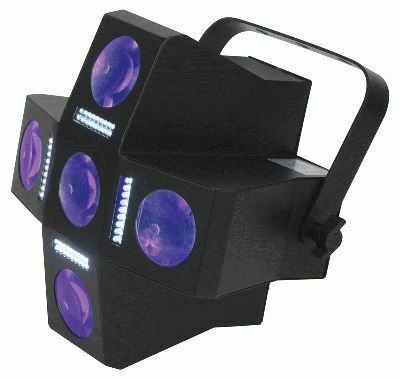 The Fun Factor LED is 2-FX-in-1 – a DMX moonflower and strobe effect -- with a total of 5 lenses and 4 strobe strips. Its moonflower effect is powered by 210 LEDs (60 red, 75 green, 45 blue and 30 white). Its strobe effect utilizes 72 white LEDs – for a total of 282 eye-popping LEDs in all! Great for small clubs, bands, roller rinks and mobile entertainers, the Fun Factor LED is easy to use and can be operated in 3 modes: DMX-512, Master/Slave or Sound Active. When in Master/Slave or Sound Active mode, it runs to exciting built-in programs. Up to 17 Fun Factor LEDs can be linked together via the unit’s IEC connectors – for an even greater fun factor! 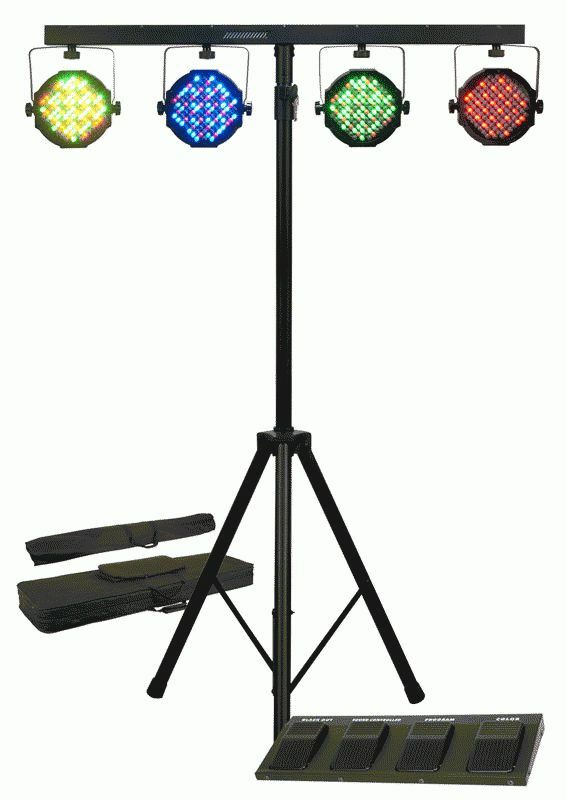 Mega Par Profile Sys – An all-in-one LED par system for mobile entertainers and stage performers, the Mega Par Profile Sys includes everything needed to set up and run a great light show on the go: 4 x Mega Par Profile LED wash fixtures, 1 x foot controller, 1 x lighting stand, 1 x stand bag, and 1x soft case for lighting fixtures. The Mega Par Profile fixtures themselves are ultra-bright, slim RGB color-mixing units, each containing 109 x 10mm LEDs (26 red, 46 green and 37 blue) that produce extremely bright color washes and have a long lamp life of 50,000 hours. The units feature American DJ’s exclusive sit-flat design, with their power and DMX connectors intelligently positioned on the side of the unit, rather than the rear, giving them the versatility to be placed directly on a floor without the bracket, in addition to being hung. Ideal for traveling performers, the Mega Par Profile Sys is easy to set up and take down. Featuring Electronic Dimming and Color Strobing, it can be operated in 6 different modes: Static Color, Manual Dimmer Color, Built-in Programs, Auto Run, Sound Active, and DMX-512. Extremely energy efficient, the entire system draws just 50 watts of electricity at maximum use. 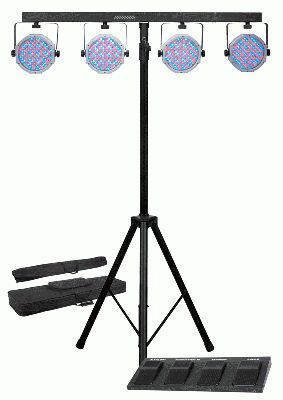 Jelly Par Profile Sys – Like the Mega Par Profile Sys (above), the Jelly Par Profile Sys, is a complete LED par system for mobile entertainers, comprised of 4 x Jelly Par Profile LED wash fixtures, 1 x foot controller, 1 x lighting stand, 1 x stand bag, and 1x soft case for lighting fixtures. The difference is in the casing of the fixtures themselves. The Jelly Par Profile fixtures feature American DJ’s revolutionary see-through plastic case, which allows their colorful LEDs to shine through, giving the unit a unique “glowing” appearance, which actually makes it two effects in one! Aside from their translucent case design, the Jelly Par Profile units offer the same great features as the Mega Par Profiles, each containing 109 x 10mm LEDs (26 red, 46 green and 37 blue). They also offer the same low-profile sit-flat design, low 50-watt power draw, Electronic Dimming, Color Strobing and 6 operational modes: Static Color, Manual Dimmer Color, Built-in Programs, Auto Run, Sound Active, and DMX-512. Double Phase LED – The Double Phase LED is an exciting dual barrel mirrored lighting effect that produces large color-changing beams via its two powerful 10-watt CREE 4-in-1 (red, green, blue and white) LEDs. Featuring a 150° beam angle, its wide beam spread makes it great for nightclubs, roller rinks, bowling centers and mobile entertainers, yet it consumes just 40 watts of power maximum and its long-life LEDs will run for 30,000 hours. ETL approved, the Double Phase LED can be used safely and in compliance at a variety of installations. A versatile effect, it can be operated in Sound Active or Master Slave modes to its own built-in programs, as well as with a DMX controller, and it also features Dimming and Strobing. InnoScan LED and InnoRoll LED -- A flat mirrored scanner and a barrel mirrored scanner respectively, the InnoScan LED and InnoRoll LED are high-output 50-watt intelligent fixtures that offer extraordinary performance. Ideal for ramping up the excitement at clubs and discos – and great for bands and DJs too – each unit features 6 gobos plus spot and 8 colors plus white, for a variety of eye-popping visual effects. Both scanners can run in 3 operational modes: DMX-512, Master/Slave or Sound Active. Both also feature multi-voltage operation: AC 100V-240V, 50/60HZ.